Since I was very young, summer in Hawke’s Bay has for me been synonymous with haymaking, Christmas lilies, and an urgent fever of activity directed at the abundance of fruit and vegetables that burst forth. Whenever I see a jar that looks vaguely like it could hold jam or bottled peaches I grab it and box it away with all the other jars I plan to fill one day. I am sure you would find at least two such boxes stored away in some dark corner of any Hawke’s Bay home, ready for the moment when we all finally get the time or the inclination to fill them. Bottling fruit is in my DNA. Some of my earliest memories are of being pulled into a smocked liberty dress on the hottest day of the year for the 1-hour drive to Hastings to fill the car with beetroot, peaches, tomatoes and anything else that happened to jump into the boot. Even though they appear every year, the constant stream of summer fruit and vegetables coming into season still always fills me with amazement and delight, closely followed by a nagging need to grab the biggest preserving pan I can find and start peeling and chopping up a storm. Now, I really don’t have the time for bottling and preserving, and drowning all that beautiful fruit in tons of sugar is no longer desirable. I have never smoked cigarettes, but I can imagine just how smokers must feel when they are giving up, when I have to resist a box of second apricots which are calling out to be turned into chutney or jam. Other than preserving, there are other simpler, faster and healthier ways to prolong the fruit season; one is to simply wash the fruit and then throw it whole into the freezer. As long as you don’t leave them there for longer than 6 months they will retain their flavor and nutritional value. Every summer I enjoy reacquainting myself with the wonderful people that grew all this bounty. They were as big a part of my childhood as my doctor or most of my second cousins; the apricot lady on the way into town and the Caccioppolis for apples were just some of these people who we visited every summer. So maybe I will simply have to get over myself and just enjoy the summer fruit as much as I can while it is here, and then when winter comes, hunker down with a good red by the fire and the odd roast brussel sprout. 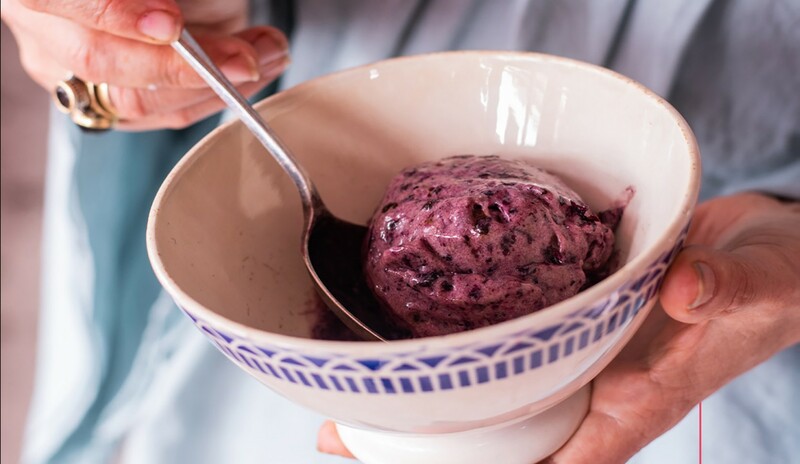 Gluten-free, dairy-free, egg-free, sugar-free, yummy ice cream and an especially good recipe for children to make and eat. A couple of things need to be done the day before. Line a large oven pan with baking paper and place the blueberries onto the paper in a single layer, sprinkling the maple syrup over the top. Now put the tray into the oven for 30 to 35 minutes until the blueberries have started to go sticky and syrupy. Put these into a bowl and into the fridge to chill overnight. Peel the bananas and slice on the diagonal, and freeze overnight. So the next day take the bananas out of the freezer and leave them on the bench to warm up for 5 minutes, then put the bananas and the blueberries into the kitchen wizz and blend them until they are smooth. You want this to happen quickly as you don’t want the bananas to warm up and go soft. If hard banana clumps form, stop the wizz and break them apart with a knife so they will blend faster. Once smooth, take the ice cream out of the food processor. It is now ready to eat, or freeze for later. This is a great summer salad. If you want it to be vegan or dairy free just don’t add the halloumi but maybe add more avocado and dukkah. Put all of the ingredients into a food processor and pulse until you get a coarse grind. Put the watermelon and cucumber into a large bowl, add the mint, pinch of salt, and mix them all together. Lay this mix onto your serving platter. 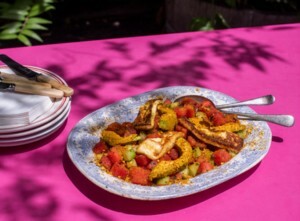 Take the avocado out of its skin and cut it into even slices, dip the slices into the dukkah and turn over until they are covered, then lay the avocado on top of the watermelon mix. Heat a frying pan to high heat and add a glug of olive oil. Dip the halloumi slices into the dukkah, coating them evenly, then place them into the hot pan. When the halloumi is brown turn it over and brown the other side, sprinkling over more dukkah for good measure. Place the melted halloumi on top of the salad, and sprinkle over 2 tablespoons of extra virgin olive oil. Finish with a good grind of black pepper.